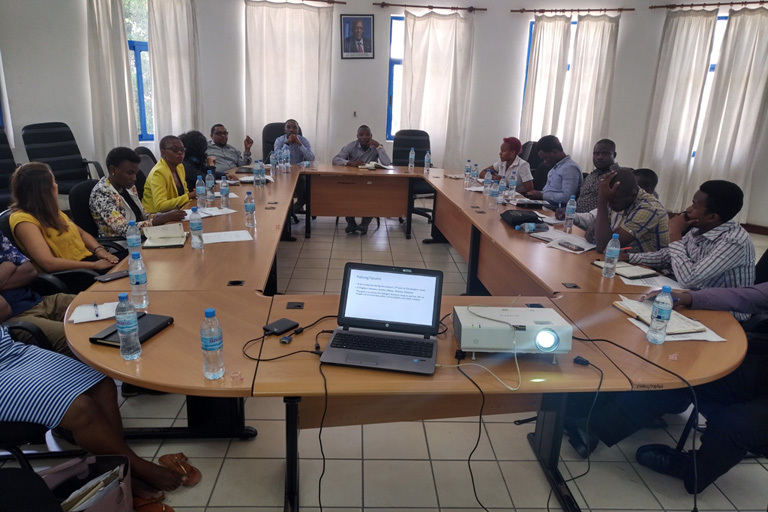 Haki na Usalama Forum’s Third Stakeholders Meeting took place on February 26, 2019 in Dar es Salaam. It was hosted by the Commission for Human Rights and Good Governance (CHRAGG) and attracted representatives from a variety of civil society organisations, as well as Tanganyika Law Society (TLS) and Tanzania Police Force (TPF). Alexander Hassan, acting Executive Secretary of CHRAGG welcomed the participants, noting that it has been a while since the Forum met. Nevertheless, Mr. Hassan emphasised that it is a very important time for the Forum to formally resume its activities due to the urgency of many of the criminal justice issues the Forum is tasked to tackle. The Forum’s Coordinator – Stephen Msechu of TLS – then proceeded with an overview of the history of the Forum, its activities in 2016-2017, and Forum’s fundraising efforts in 2018. He finished his presentation by describing Forum’s achievements in advocacy and dissemination of the Forum’s papers, specifically noting huge demand for the Forum’s papers and, therefore, the need for more copies to be produced. The Coordinator expressed his gratitude to Mr. Joram Mwakansope of TPF for his tireless support of Haki na Usalama work within the police; Francis Luziga of CHRAGG for field research, advocacy, and dissemination; Hanns Seidel Foundation (HSF) for its support of the Forum; and Commonwealth Human Rights Initiative (CHRI) for research of the Haki na Usalama publications and all-round backstopping of the Forum’s work. Haki na Usalama has always been a broad church, uniting under one roof representatives from Tanzania’s most prominent CSOs, independent institutions like TLS and CHRAGG, as well as government bodies like TPF and the Office of the Attorney General. The Forum offers vital space for stakeholders on democratic policing and criminal justice reform to meet, discuss pressing and long-standing issues, and design appropriate interventions. TPF benefited a lot from the Haki na Usalama publications, especially the three position papers. We hope this cooperation will continue. The meeting was set in the context of TLS receiving support from the Open Society Initiative for East Africa (OSIEA) to do research, advocacy and stakeholders’ capacity building in variety of policy areas including criminal justice and democratic policing. Mr. Pasience Mlowe of TLS provided the participants with an overview of the grant, titled “Upholding fundamental freedoms, good governance and the rule of law”, which was followed by the presentation by Mr. Uladzimir Dzenisevich of CHRI on planned interventions under the Activity 5 of the project that focuses specifically on democratic policing. A discussion on Forum members’ role in implementation of the Activity 5 ensued that transitioned into the discussion of upscaling the Forum’s work and strengthening its institutional capacity. The latter discussion resulted in Forum members adopting a resolution to that effect.